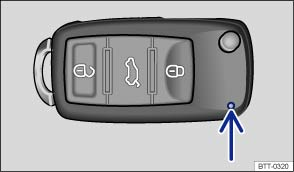 If a button in the vehicle key is pressed briefly, the indicator lamp (arrow) flashes once. The lamp will flash several times if the button is pressed and held, e.g. convenience opening. If the indicator lamp in the key does not light up when a button is pressed, the battery in the key needs to be replaced .